Finally, a zombie game the whole family can enjoy...or not. Pet Zombies' biggest issue is its price. At $29.99, it's $25 more than it should be. That, combined with constant level grinding, makes Majesco and 1st Playable Productions' latest yet another third party misfire for Nintendo's 3DS. The concept of having a pet zombie, as opposed to a cat or dog, is a fine idea, one the developers manage to pull off with a T rating, despite the fact that players can not only torture their undead friends (innocently, of course), but also feed them a constant supply of brains. To that end, the game has a certain level of charm. 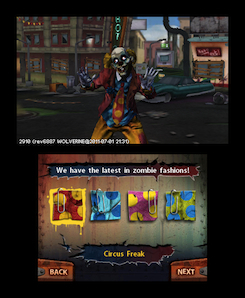 Users have eight unique zombie types to choose from, including a decaying waitress, a shriveled granny and a scary clown. After selecting one, they can do light customization, picking a different face and outfit. 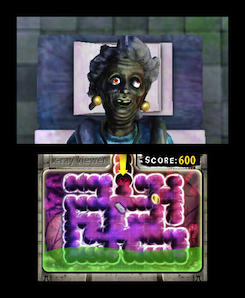 From there, it's all about spending time with the zombie by feeding it brains/bones, playing catch (as expected, zombies have deteriorated motor skills) and even taking part in five unique mini games, one of which tasks players with firing their zombies with a slingshot and keeping them airborne while gathering coins. The more time someone invests, the more he or she levels up and new items and mini-games appear, but that's precisely the problem. The developers locked away much of the game, forcing players to perform the same mundane tasks for hours. To be fair, Pet Zombies becomes somewhat enjoyable once these things become available. Before long, players can throw tennis balls, distract their pets with a laser pointer and decorate their zombie's habitat using a variety of set pieces. There's also something to be said for intentionally lighting a zombie on fire with a torch, just to watch it squirm. That, sadly, doesn't hide the fact that players have little to do, aside from completing the same mundane tasks to earn in-game achievements. Harassing a zombie with a shock collar is decent fun, but not at $30. With this in mind, Pet Zombies is one huge snore fest. We don't think it's terrible, but with so many games already available for 3DS, players should spend their valuable time elsewhere, instead of poking a monster with a scrub brush. What's Hot: Nice variety of zombies to choose from, five entertaining mini-games, lots of different items. What's Not: Too much grinding, significantly overpriced.